It is my experience that men like dishes with crusts and particularly that my father-in-law adores cobbler. I had to go to his town this morning for court (45 minutes away) and happily had two slices of this concoction left over from last night's baking so took them on a plate, and they were happily received. Spread cherry mixture in a glass pieplate. Top evenly with crumb topping. Bake at 425 for 15 minutes, then reduce heat to 350 and bake 30 minutes more. Oh my, this is so good. And not even that bad for you. "Because their job often 'prices' them at a per-hour dollar amount, people will put this same price tag on their nonwork hours. They begin to question everything, asking themselves, Is this worth my time? As a result many people hire workers to do the household chores that they might actually enjoy doing. . . If I make a salad that takes an hour to prepare, allowing to me wonder and reflect as I enjoy the . . pleasures of chopping and dicing. . .why should I rush and diminish my pleasure in the experience, or delegate the task to someone else? I could be working, but one is no replacement for the other. . . If I had been thinking about the dollar value of this time I would have hired someone else to do the work, but I would be giving away something I really enjoy doing. I am paid substantially for my time serving clients as their lawyer. If I were to apply my hourly rate to my free time, I'd never do any gardening. I'd be sitting at my desk working nonstop. I'd lose all the simple ways I enjoy living every day. . ."
Me: "Two thirds cup rice milk." Bella: "That's one slash three filled up twice!" She did a lovely job, and she has laid a nice array of slices in a vintage pie plate to take along to our Bible study group tonight, where I know she will shine with accomplishment as she passes it around. My Lady Banks rose is looking gloriously ready to bloom. I love the pale yellow pompoms that cover the arbor when it's in full swing. I planted this rose four years ago, I think, and it is a *generous* grower, with many branches at least fifteen feet in length. Fortunately, since it's sending itself all over the path and I can't bear to prune it back, it is thornless! I have been making these cookies for many, many years, ever since I was a little girl working from a recipe card that said "Dubble" at the top (my oldest sister: not that great a speller). These are the cookies that invariably filled my Nanny's cookie jar; mine are good but never quite so good as the ones she always had on her countertop. between a half and a whole bag of chocolate chips--I like lots! Bake at 375 on an ungreased cookie sheet, but don't brown--I take them out as soon as they've lost their shininess but are not brown yet. I like to make these in my stand mixer and "Dubble", or even "Tripple" the recipe. Day trip today! The Composer's dad and step-mother invited us to spend the day with them at their cabin. It's up in the mountains past many fields of cows and horses for Daisy's viewing pleasure, on a little river which at this time of year blooms an unbelievable opalescent turquoise. 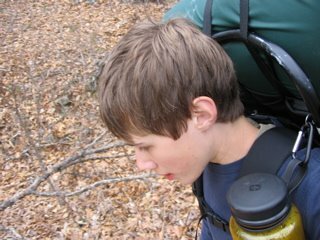 We managed quite a hike--about 2.5 miles up the next ridge and then back down. I don't know how the Composer did it, but he hoisted Daisy the whole way in her backpack (not her favorite). 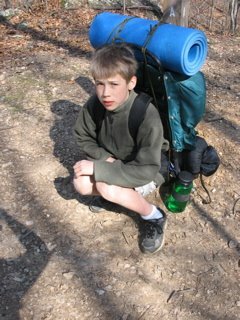 I fixed a pot of chili to simmer at the cabin before we set out on our hike, and when we got back we were tired, hungry, and happy to sit down and eat. A big game of rummy, then we bundled into the car and drove home in the dark. The last twenty minutes of the trip featured Daisy's wailing of the phrase, "Nursey in caaaaarrrr!" one hundred and forty-one times (actually). She was very glad to hit the sack. After I put dinner in the oven this evening I gathered the kids up in the car for a quick adventure--I had heard that there was another school building for sale right around the corner of the mountain. We've been in love with this building for over ten years but it's not been on the market until just now. It sits on a hill and is called Fair View. It was built in the '30's out of blocks of sandstone. Sigh. The field around it had *just* been mowed, the air smelled spicy and sweet, and the last long beams of sun made everything look gilded. We wandered inside and fell in love: twenty-foot ceilings, two main rooms with a mahogany sliding divider, a stage, a long (20 feet or more?) blackboard running along the wall, both pot-bellied stoves still intact with stone chimneys, all the original benches piled in the center of the room. Stone walls, of course. I called the realtor and a sale is already pending. But. Sometimes things fall through, and the Composer needs an off-campus studio! We came home to a delicious-smelling dinner done to perfection: oven mustard chicken, Carol's rice pilaf, sauteed Swiss chard, and a nice vinegary romaine salad. In a small bowl, combine about 1/2 cup grainy mustard, 1/4 cup olive oil, 2 T. thyme, and 1 t. salt. Use to coat pieces of cut-up chicken. After they are coated, roll them in fine bread crumbs. Lay in a greased casserole dish and bake at 375 uncovered for 45-60 minutes. Chop half an onion, two stalks celery, grate two carrots, and mince 2-4 cloves of garlic. Sautee all in olive oil until transparent. Add 3 c. brown rice and stir to coat. Add 6 c. chicken broth (I used about half broth and half water) and salt and pepper. Bring to boil, cover, and turn down to simmer for 45 minutes. Done, as all rice is, when liquid is absorbed and those cool-looking craters have formed on the surface of the rice. Square foot gardening has been around for a while and always intrigues me but I've never made the leap to using this method exclusively. 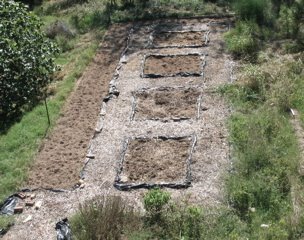 I do have a modified sort of square foot garden, in that I have permanent beds placed in permanent paths for my vegetables, and I dig rotting leaves and compost into my planting beds every year. My friend Jody has invited Giles and Felix to join her boys in forming a "square foot gardening team" in a contest that the organization is sponsoring this summer, which involves planting, tending, and documenting through writing, photos, and video. It sounds fantastic and I hope they win lots and lots of cash! Windex on a paper towel is most effective for removing pencil and colored pencil marks from the computer keyboard. That does not mean that Daisy is free to keep writing on the laptop. I have seen Windex recommended for cleaning the monitor screen but this horrifies the Composer so I stick to a dry microfiber cloth. Between-the-keys crumbs are best blown away by the can of compressed air with the little green straw to direct the spray where needed. That's all I know. . .
My big project today was The Pantry. Frankly, I have been looking at the wad of gum stuck to the floor next to the trash can for long enough. The pantry would stay a lot cleaner if it didn't also house the kitchen trash, but that is What Is, so maybe I should just clean it more! The shelves were actually in great shape and have been ever since Clara has taken over the organization of the pantry. When the groceries come into the house, the kids unload them and sort them into refrigerator pile and pantry pile. Clara then takes over as sole stocker of the pantry, and the canned and dry goods are always in perfect order, thanks to her tidy nature. It was the lower half of the pantry that needed my attention. I removed everything from the floor, washed my potato and onion bins, wiped down my wheat buckets, and then got in on and my hands and knees with a bucket of hot soapy water and scrubbed the walls, baseboard, and floor. That was some dirty water in my bucket when I was finished. When everything was dry and fresh I moved everything back in and admired. Nice. Happy to say that Giles and Felix made it home in one piece each! The weather was much better than they expected, and neither went hungry. Giles brought home many photos of the beautiful lacy brown and gray woods, and Felix had a couple of good bird sightings. We are enjoying what is most likely the last fire of the season. One last weekend of chilly rain, then on to better things! When it warms back up I will empty all the ashes out of the woodstove, clean and store the red enamel teapot I keep filled with humidifying water on top of the stove, and move the Boston fern back onto the stove. The mudroom will get a *thorough* sweeping out after a winter of bringing logs in and out, and that will remind me to wash all our winter coats and pack them away for the season. I love changing seasons! 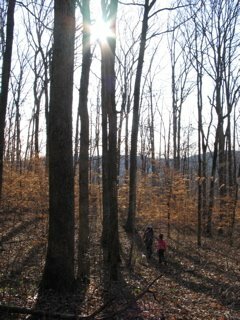 I have sent Giles and Felix into the woods on what is sure to be a "memorable" weekend--hiking and camping with four uncles, a cousin, and a grandfather. The high for the next two days is in the forties, and nothing stands between the boys and a 70% chance of heavy rain but two-dollar ponchos from Wal-Mart. As soon as they left I realized they had forgotten their can-opener (there went dinner), and their packed lunches (they speak for themselves). Thanks to modern technology, however, this crisis was text-messaged to the Uncle in Charge and remedied. The Composer's parting words to Uncle in Charge, who is known for his hardy optimism: "Please don't turn this into the Freezing Rain Death March." Tamari soy sauce is my favorite secret ingredient. Not only does it have a deep, rich, salty taste, it adds a wonderful dark brown oily shimmer to anything it's a part of. I love it so much that I buy it by the quart jar at the health food store--although I try to take it easy since it's probably high in sodium (you think?). It's been years since we've touched regular old grocery store soy sauce--once you've tried tamari there's no going back. Splash filets or breasts with plenty of tamari sauce, sprinkle with sugar and rice vinegar. Let sit for half an hour, then grill or broil, basting occasionally with leftover sauce (be sure and stop basting in time for the last application to cook thoroughly). Cube or thickly slice any amount of potatoes, sweet potatoes, carrots, peppers, eggplant, etc. Toss with crushed garlic, a little olive oil, and a big splash of tamari. Cook at 425 for 45 minutes or so, checking for burning/doneness and adjusting as necessary (I'll cover to soften vegetables if they're not cooking fast enough, or uncover to get them browner). Add lots of fresh-ground pepper before serving. To a bag of shredded cole slaw, add thinly sliced red pepper, cucumber, and green onion. Make a dressing with 2 parts mild olive oil, one part balsamic vinegar, and a big slug of tamari. Stir in half a cup (or a cup!) of sliced almonds which you have browned in a little oil. Oh my! 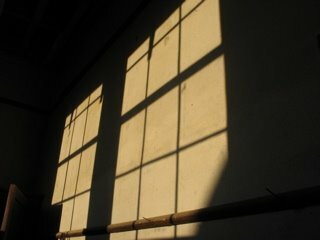 Giles took this picture of the afternoon sun coming in his window. 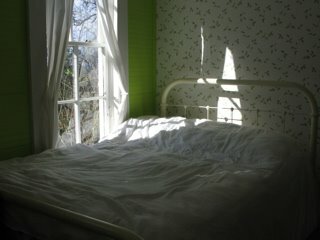 I love the bright apple green paint we used in his room--on one wall only. The other three walls are papered in white with little green leaves, and the wood trim is all painted my favorite Benjamin Moore Atrium White. I have a special fondness for this room because it's the first one in the house where I really let the color rip--wait til you see Daisy's Mango Lounge. I posted a picture before which only shows her one *white* wall! With several birders in the house (one of them "avid", let's say), we have been revelling in hours and hours of bird footage and facts in the wonderful series "The Life of Birds." This is a seemingly endless series of nature shows which my mother found at Netflix and has been forwarding on to us. 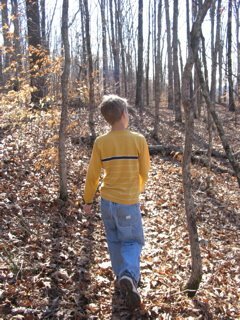 Several of the children cannot hear anything interesting or exciting about birds without immediately relaying that information to me, even if I am sitting within earshot and heard it the first time. But I'm not complaining--I appreciate their enthusiasm! 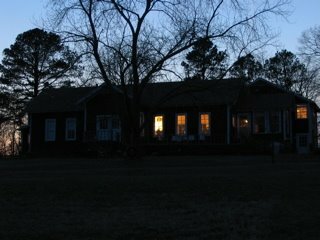 Having the house open, especially after dark, is one of my favorite things about warmer weather. The house takes on a smell that it never has at any other time of the year when the doors and windows are all standing open to let in the night breeze. The frogs in all the neighbors' ponds have started their spring calls, and I can hear the wind blowing up the backside of the mountain. I am blessed to live in such a quiet, safe place. This one was lots of fun to sew! I found some black grosgrain ribbon in my piles and trimmed the yoke with it. I used shiny round black buttons to fasten down the back and the effect is stunning. . .
One of the nice side benefits of sticking with a set grocery day is that the day before (that's today!) I can work on cleaning everything out. This usually means a big pot of soup or stock, which is great for any leftover cooked vegetables (nothing cruciferous please), the end of the bag of celery or carrots, and the frozen chicken carcass maybe left over from a roast chicken earlier in the week. I also try to empy the fruit bowl by squeezing tired oranges into juice, force-feeding apple slices to the children (not *real* force), and giving Daisy the run of the tangerines. I also try to use up any salad vegetables I still have in an enormous salad or a plate of sliced cucumbers, peppers, or whatever I've got, at dinner time. A quick wipe to the shelves and around the walls with a spritz of grapefruit cleaner, and I am good to go tomorrow. The spatially-gifted Composer undertakes the job of fitting a week's worth of groceries into the fridge for me, and it's much, much easier when I've cleared a path. 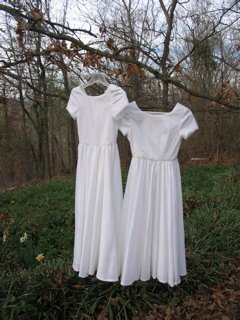 Clara and Bella's dresses finished and hanging rather spookily outside near dusk . . . not meant to be scary! They do have lace around the sleeves which looks beautiful up close. I love Daisy looking like a retro Vintage Housewife in this blue gingham dress! A big day for Daisy: the move from the crib to the Big Bed. She had a very successful nap under this delightful chenille spread, with a lovely view of the daffodils in the back yard. She seems happy to move on from the crib. 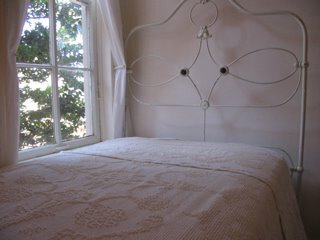 Thanks to my mother for such a wonderful hand-me-down (bed, mattress, box spring, bedspread!). I don't usually get bogged down with my sewing projects (could it be my approach of making the same pattern over and over and over? 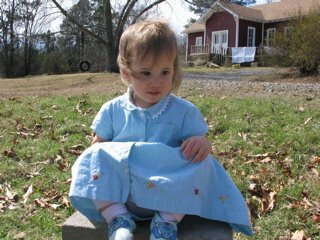 ), but the big girls' Easter dresses have taken forever! 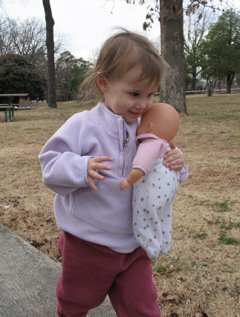 Unfortunately I experienced a Fitting Issues with Clara's and a Fabric Issue with Bella's. With Clara's bodice I took in the sides *a lot* to get a nice trim fit. Duh, there went my armscye. So I had to recut the armscye curve four times as my lining was already stitched together and so was my fashion fabric. Sigh. Bella's was darted so wasn't as tricky to fit (I am so in love with darts, there are no surprises there! ), *but* after completing everything but the zipper installation I realized that the fabric was more transparent that I had thought. The facings showed right through, especially against her gorgeous skin. Ack! Sleeves were already in with the seam allowances trimmed and zigzagged. I took a few days to work up the necessary determination before ripping out all the facings, constructing a lining, binding the armholes, and sort of floating it down the bodice and hand-stitching it over the waist seam. I am *glad* to be finished and on to the next project! 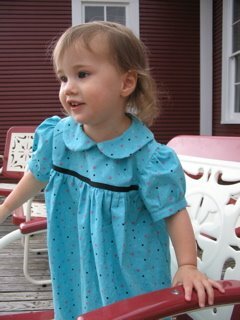 Which happens to be a turquoise play dress for summer, for Daisy, which sports pink, white, and black polka dots and is trimmed in black grosgrain ribbon! Photos to follow. 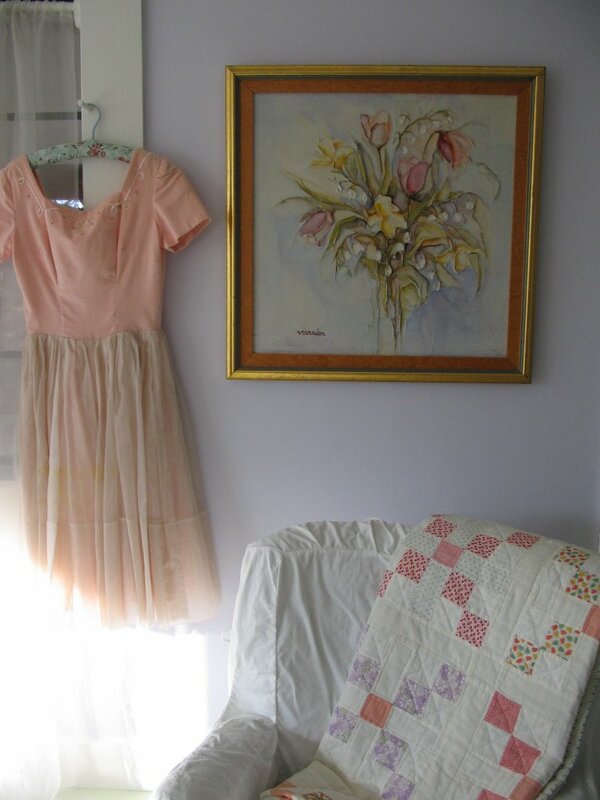 . .
My favorite oil painting (by glamorous family friend Carol V.), favorite vintage quilt, and absolute favorite vintage dress, handmade by my great-grandmother for my mother to wear her freshman year of college--darted pink velvet bodice handtrimmed with sequins and seed beads, silk chiffon skirt. I wore it to a dance in 10th grade, but now it intermittently brightens my bedroom. We had clothesline weather this week, and it's been so nice! I love the smell of line-dried clothes, of course, but I also love how they look hanging on the line, I like being out at the edge of the woods hanging them up, listening to birds and squirrels and checking out the daffodils. I love clothespins; I'm a late-life convert to the old-fashioned peg. I've always used wooden spring clips in the past, but they do tend to fly out of my fingers like catapults, or twist apart. The pegs are great for everything but the bulkiest jeans and towels--and I often hang those out without pegs anyway. I'm also a late-life convert to the umbrella line, which took some getting used to. We finally realized that aesthetically it just wasn't working to have thirty feet of clothesline stretched across the yard *right* where you wanted to walk to get to the pool, and ordered an umbrella clothesline from Get Organized . It holds about four loads of clothes, so no complaints there. The only drawback is not being able to spread quilts out full length. 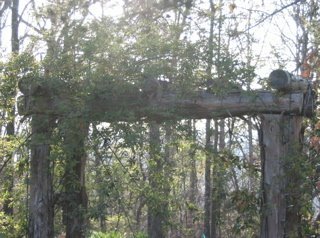 For that I just use the porch rail, so tacky. Daisy and Baby at the zoo last week. 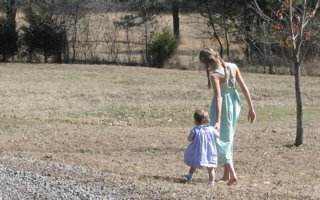 Clara, stalked by paparazzi, accompanies Daisy down to view the chickens.